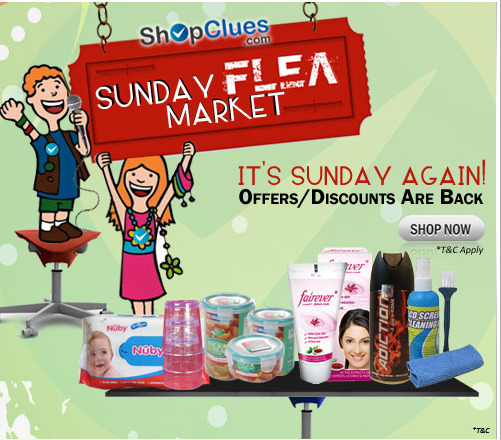 Dealsnloot Readers,This time Shopclues is back with another Loot Offer SFM (Sunday Flea Market) Shopping League Contest. In this offer Every 10th Shopper will be rewarded Free 300 Cluebucks. You have to Purchase products only from Shopclues Sunday Flea Market to be eligible for this offer. SFM Shopping League is Live from 5 pm Saturday to 5 pm Monday commencing from 24th April 2016 to 23rd May 2016, inclusive of both the days. Read Terms & Conditions Carefully.And Grab This Loot Offer. Shop more for different products to increase your chances of winning. Applicable on Indian nationals 18 years and above. Under the present Contest, unique SKU’s will be considered; for each shopper, one product will be counted as one only, irrespective of quantity of the same product. Shop more for different products to increase your chances of winning. Redemption: CluesBucks can be redeemed sitewide on all platforms within the CluesBucks expiry period. Expiry of CluesBucks: CluesBucks credited to the user’s account under this contest shall expire after 7 days from the date of issue. A registered user is a customer with a valid ShopClues account. This offer is non-transferable to any other user. ShopClues reserves the right at any time, without prior notice to add, alter, modify, change any of these Terms and Conditions or to replace it as a whole or in part, the above offer by another offer whether similar to above or not, or to withdraw it altogether. In the event of any inconsistency between these Terms and Conditions and any brochures, marketing or promotional materials relating to the promotion, these Terms and Conditions shall be abiding. All decisions by ShopClues regarding selection of the eligible users shall be final and binding. No correspondence/grievances will be entertained in this connection. Any disputes arising out of this offer shall be subject to the exclusive jurisdiction of competent courts in the city of Gurgaon (India).